* Due to the many requests that we have received, we have now re-opened the abstract submission system through May 3rd, but only for posters, and postponed slightly the deadline for early registration. Instructions on how to upload your abstract can be found here . ** The US National Science Foundation has approved a grant to partially support the travel expenses of Statphys27 participants from US institutions. You can apply by June 30 from the following link. *** This deadline does not apply to people that have been granted a reduction of the registration fee. We will inform you separately when the system is ready to pay these special fees. *People with PhDs obtained in 2017 or later are allowed to pay the student fee. ** We have postponed slightly the deadline for early registration fees. This deadline does not apply to people that have been granted a reduction of the registration fee. We will inform you separately when the system is ready to pay these special fees. 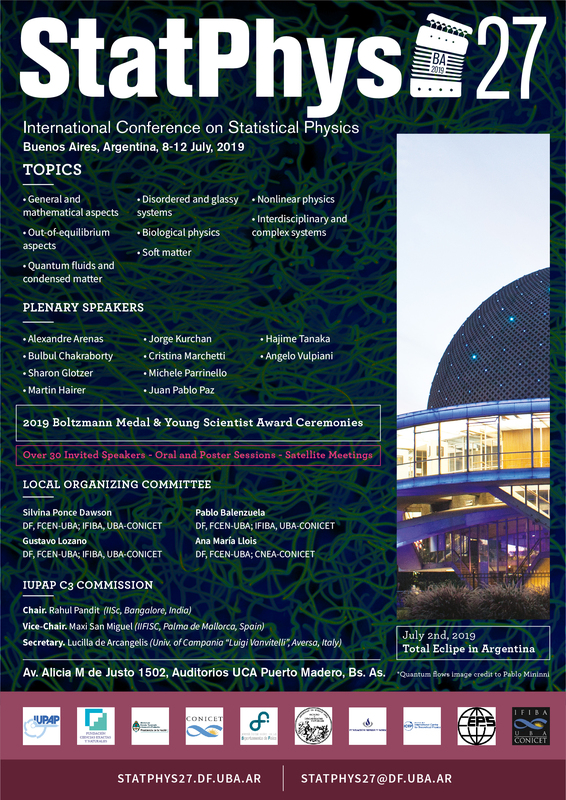 Please download and print the poster of StatPhys27 to spread the news about it. The poster is available in two flavors: with clear and with dark background. The latter features a vortex tangle in a numerical simulation of quantum turbulence produced by P. Mininni and his group. 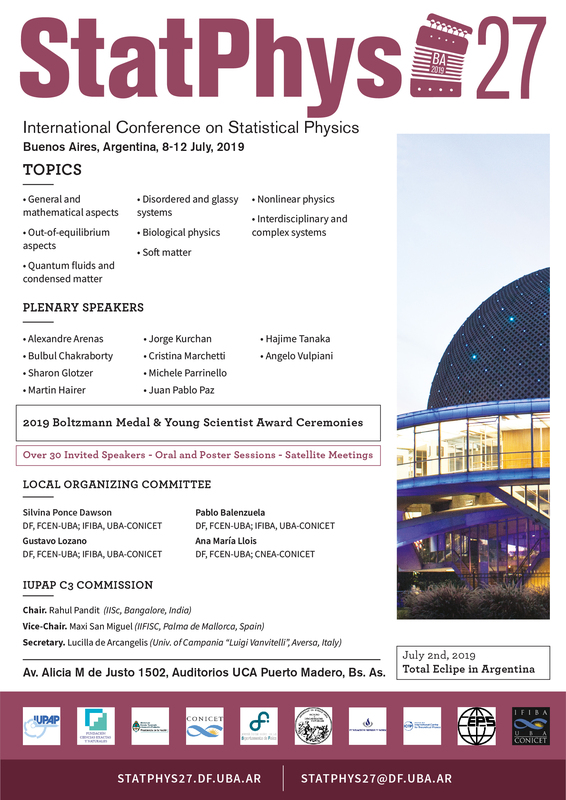 StatPhys27 will be conducted in accordance with IUPAP principles as stated in the IUPAP resolution passed by the General Assembly in 2008 and 2011. In particular, no bona fide scientist will be excluded from participation on the grounds of national origin, nationality, or political considerations unrelated to science. It is the policy of the IUPAP that all participants at an IUPAP-supported Conference will enjoy a comfortable experience, and that they will treat each other with respect at all times. The conference organizers will name an advisor who will consult with those who have suffered from harassment and who will suggest ways of redressing their problems, and an advisor who will counsel those accused of harassment [Section 4 IUPAP Conference Policies]. Embajada de la República Federal de Alemania Bs. As.